Earlier, we wrote that many in the press seemed to be impressed with the debate presentation last night by Fox News and moderators Bret Baier and Chris Wallace. Well, according to Rush Limbaugh, who was not such a fan, that’s exactly what the network wanted. He accused the network of helping the GOP candidates fight each other instead of President Obama because they wanted approval from the mainstream press. 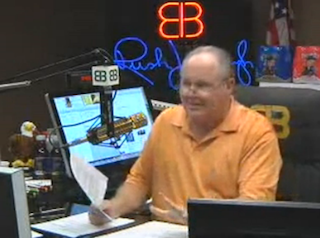 The conversation began as Limbaugh acted reluctant to discuss the debate at all. Soon after, he mentioned reading what sounds like a live blog (amusingly, Limbaugh grumbled about not knowing if he had actually ended up on that damn Twitter thing) and reading that many were annoyed with the questioning of the Fox News team. He explained that, at first, he blamed the candidates. Every few days on The Five, one of the hosts acts astonished at the idea that some Liberals would want Obama to move further to the left. I can imagine that some of those same Liberals would be equally dumbfounded hearing anyone think Fox News doesn’t do enough for the right.